Digital marketing is becoming increasingly important for organisations. It is predicted that by 2020 companies will spend 75% of their total marketing budget on digital marketing. To do this, businesses are diverting their marketing spend away from other channels such as print media and focusing on digital, showing just how important this channel is. It also tells us that companies who fail to redistribute their marketing budget accordingly into digital will be left behind. So, where do you need to invest your time and money in 2019? The number of online searches done by voice are growing and the data suggests that they will continue to do so. The go-to stat in digital marketing when discussing voice is that 50% of searches will be voice by 2020. That is certainly a significant shift in the way people search online. The good news for your business is that not all companies are making the most of the power of voice search. This means that if you take the necessary steps to optimise for voice, then you can get ahead of your competitors in this space. SEO optimisation for voice is slightly different to optimising for typed search and it brings a number of challenges for us as marketers. No screen for results – ranking first has never been more important. If you’re the number two voice search result, then a voice assistant will only read out result number 1. Ranking second means that you’re just the first loser. Longer search queries – the way people use voice search is more conversational than a typed search and you can expect more question-based search phrases. Retained context of previous search – if you ask your Google Home device ‘what’s the weather like in Barcelona?’, get a response and then ask, ‘how much are flights?’, Google will retain the context of the initial question and give you the answer about how much flights are to Barcelona. It won’t treat your second question as a brand-new search. 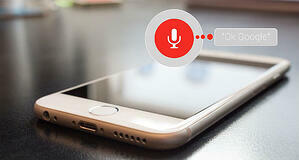 Local searches more likely – local voice searches are on the increase, especially with voice assistants becoming better and better in cars. Searches such as ‘where’s the nearest petrol station?’ or ‘where’s the nearest coffee shop?’ are becoming commonplace when on the move. Having your Google My Business and Bing Places for Business listings optimised so your business appears in local map searches is becoming increasingly vital. Dealing with misspelling and mispronunciation – the accuracy rate of voice assistants is now 95% compared to 75% in 2013. It’s much better than it used to be, but still isn’t perfect and that means mispronunciation is still an issue. Disintermediation – if you ask your Google Home device to order you a pizza then it offers you a Domino’s, leading to disintermediation as this is the only result you get therefore in order to show for voice search you need to be the leading brand in your sector that answers the search query. This is becoming a wider trend online, with more business breaking away from traditional business models. Voice search is important, but it by no means spells the end for typed searches. Data shows that there is some migration between voice and typed searches, but there are lots of new searches coming about through the use of voice that are not typed. So, the message is don’t suddenly ignore typed search and put all your time and effort into voice, but voice search should be part of your digital marketing strategy in 2019. Increase understanding of a product or service – voice is helpful to explain to your website visitors what your product or service does. Video can often explain things better than just written words. Increase sales – if people understand your offering, they will be more likely to buy from you. 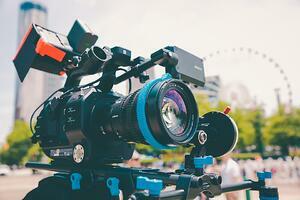 People also find video testimonials more legitimate than written ones, so this is something worth considering. Reduce support queries – answer questions in your videos and reduce the need for your staff to deal with questions. Increase time on website – encourage people to stay on your website by getting them to engage with a video. The amount of time people spend on a page is also a ranking factor in Google, as it’s an indication that your page is offering quality content that people want to engage with. In response to the growth of video Innovation Visual have a new team member joining us in February 2019 who has extensive video experience, meaning we’ll be able to shoot video in-house for our clients. 2019 is the year to get creative with the content your organisation produces, and you should certainly consider the type of content your business is producing in 2019. For example, blogs are still important, but there is scope to do more, especially when you consider that 80% of people would rather watch a video from a brand than read a blog. This suggests that it’s worth investing some time in creating video as well as writing blogs and this is where strategic advice can be helpful to make sure you’re prioritising the creation of the right type of content. Consider alternative content options. Could live video be a good way of interacting with your audience? 78% of Facebook users are already watching and engaging with Facebook LIVE, so it could be beneficial for your business to create live video content as a different way of engaging with your audience. Consider where your business is investing time in creating content and build a content strategy for 2019 to provide focus. Artificial Intelligence and machine learning are having a big impact on marketing, helping businesses to save time and allowing them to scale more quickly. 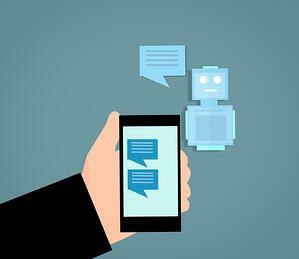 Some good examples of how marketing automation is already benefiting businesses are the use of Chatbots on websites. 80% of companies will be using chatbots on their website by 2020 and this has been driven by the increasing demand of consumers. 90% of customers now expect a response immediately and unlike humans, Chatbots don’t need to sleep. This means that using Chatbots provides your customers with a 24/7 communication method. We live in an on-demand work and marketing automation helps you deal with this trend. Google Ads and Bings Ads regularly release updates allowing you to target users through paid advertising. 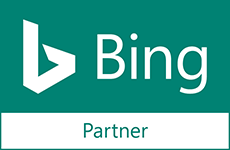 Released in 2018 in the US and now available in the UK, Bing Ads have introduced LinkedIn Profile Targeting. Microsoft acquired LinkedIn in 2016 in a $26 billion deal, so linking Bing Ads and LinkedIn together is a natural step. What this means for advertisers is that you can now target over 575 million LinkedIn members via text ads, shopping campaigns and dynamic search ads all through the Bing Ads interface. This means if you only want to target decision makers at the director or c-suite level then you can set your targeting to achieve this. The digital marketing landscape is changing rapidly. The truth is that we do not know exactly what Google, Bing, Facebook or other big players in the digital marketing world are going to announce next. All we can do as digital marketers is look at industry trends and when announcements are made adapt quickly to stay ahead of the curve. “Consumers have never been so hard to please and marketers have never had as many opportunities to please them”. The modern consumer expects a lot from you as a business including personalisation, recommendations and quick communication methods, but the tools are there to allow you to do just that. You just have to use them. At Innovation Visual the team spend 8 hours each per month training and learning to stay ahead of trends to make sure we are delivering the highest possible value for our clients.